I feel so lucky and so loved! My bridesmaids hosted the most beautiful bridal shower for me on Saturday. Every detail was so carefully chosen and perfectly fit my personality. 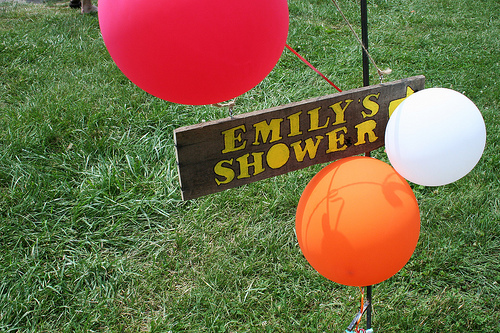 This hand painted sign directed guests from the parking lot to the pavilion and was made by lovely Maid of Honor Laura with help from the crafty Father of the Bride. The venue! 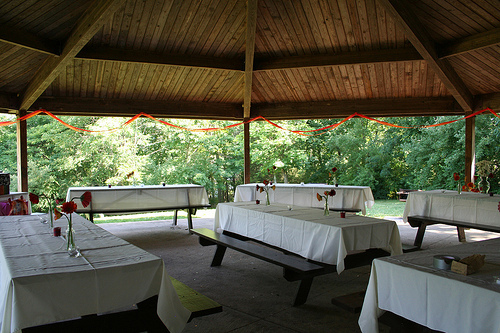 Kain County Park, lakeside pavilion, Jacobus, PA. Red and orange streamers hung (by my dad) around the circumference of the pavilion with bunches of red, orange, and white balloons. It was such a peaceful spot surrounded by trees with the lake just a few yards below us. Laura couldn’t have chosen a more appropriate setting! 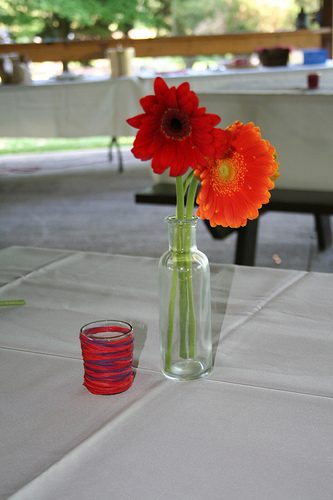 Of course the girls chose daisies — my favorite flowers — for the centerpieces. Bridesmaid Kristen H. made the arrangements, and tea candles on white tablecloths completed the sweet look. My bridal shower had the most creative theme! 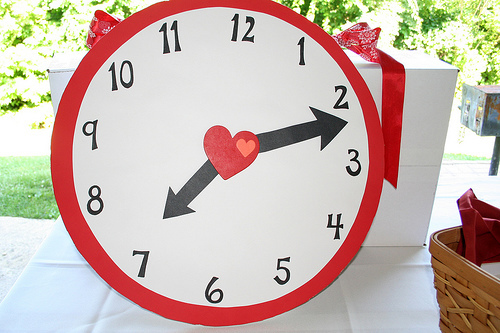 Each guest was assigned a time day and asked to bring a corresponding gift. Bridesmaid Kirsten made this big clock. The best part: my mother’s shower used this same theme 30 years ago! I must say that I have the most creative sister! 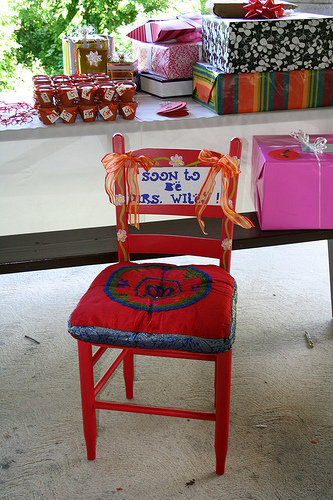 Laura hand painted this chair just for me! I can’t wait to put it in my future home. 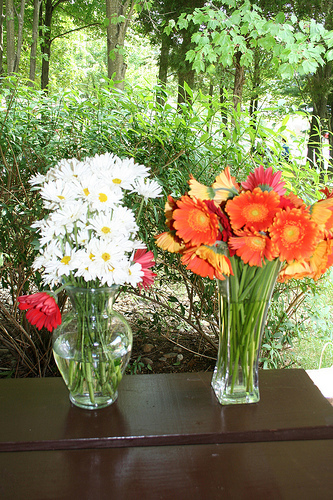 A girl cannot have too many daisies in her life. 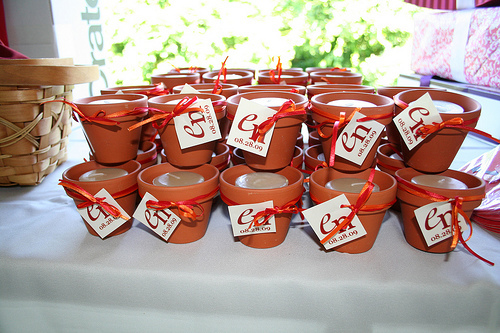 The favors were tea candles in clay pots with our monogram and date attached. Printed by Bridesmaid Mary and carefully tied by all of the girls. And the candles smelled so yummy!